There is a concrete path running around the side of the bay at Combe Martin, and further along I can see a flight of steps leading upwards. I decide the steps must join the South West Coast Path, knowing it is somewhere on the slope above, and I set off. On the way I pass a young boy who has been fishing in a rock pool. He has caught a large crab. He tells me it is only one of many – but the rest escaped. I climb the steep steps but find, to my surprise, the top section becomes progressively overgrown. I push through nettles and find the entrance to the steps has been blocked up with a wall of bricks. Why deny access? I can only think it is for ‘Health and ‘Safety’ reasons. I climb over the wall and find myself in a pretty open space overlooking the bay, with a promenade and a gazebo. 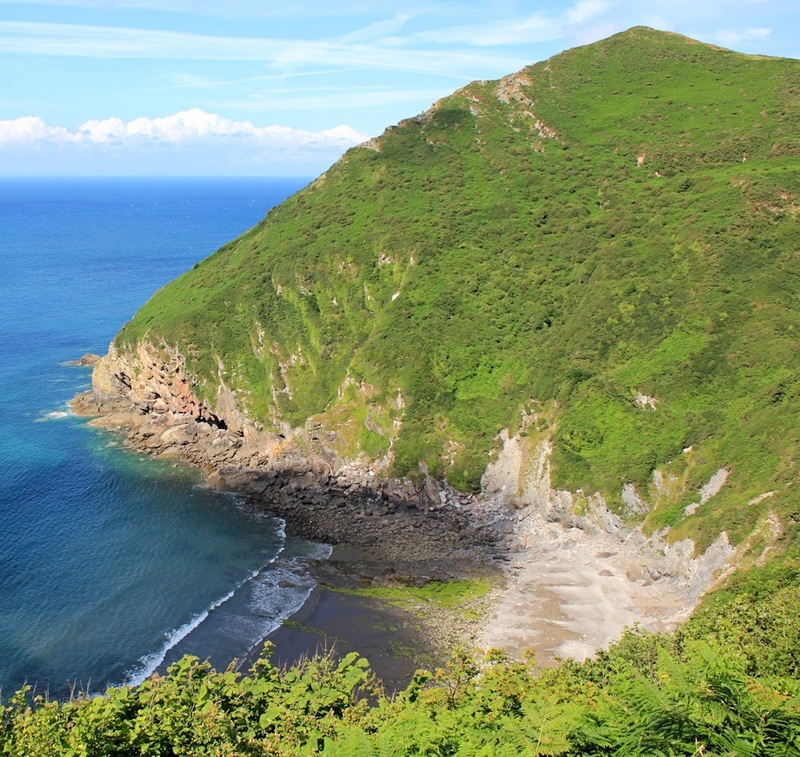 The South West Coast Path takes a steep route up the slope on the east side of Combe Martin Bay. 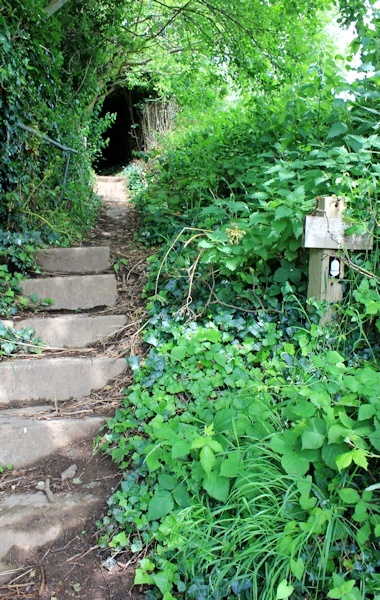 There are steps to climb and in places the path is narrow with overhanging brambles. I am relieved when I emerge from the undergrowth and see a sign: National Trust, Little Hangman. Wow. That was quick. I’m there already! And now for another disappointment. I consult my OS map and discover I am not at the top of Little Hangman after all. My climb has brought me up Lester Cliff. Ahead and below is the deliciously named Wild Pear Beach. The tall headland on the other side is the real Little Hangman. 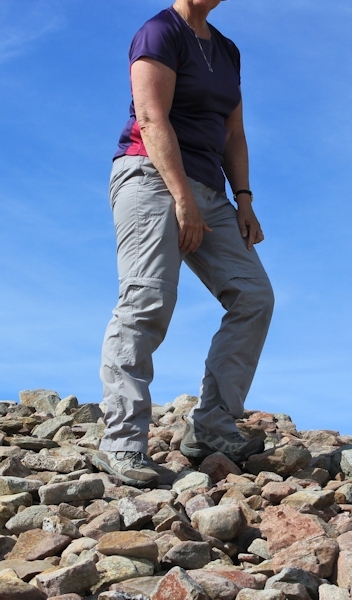 I follow an easy track up to Little Hangman and climb to the top point (218m) to have a rest and take a photo. Ahead is Great Hangman, 100 metres higher at 318m, the tallest coastal cliff in England. The way up is surprisingly easy. The path is well-worn and, although the incline is fairly relentless, it is not particularly steep. 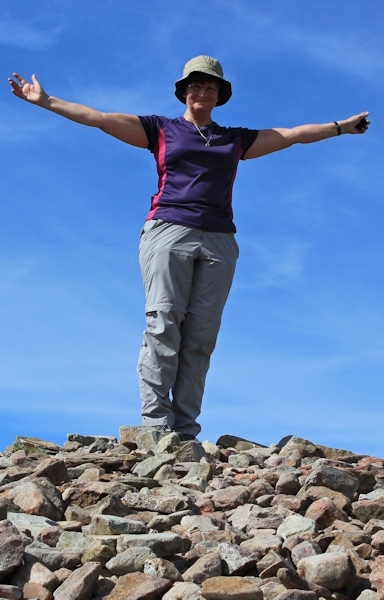 At the top there is a cairn of stones and a group of other walkers are standing on the summit, taking photographs of each other. They must have come up the other way and they look rather hot and tired. I congratulate myself on my cool appearance, and wait for them to move on. When they’re gone, I set up my camera for a self portrait, balancing it on a nearby rock, and run back to clamber up the cairn. Unfortunately my first attempt was not very successful. I adjust the camera and try again. Success! Although I know, Greater Hangman is the highest coastal cliff in mainland Britain, it doesn’t feel particularly exciting to be standing on the top. One reason is that the cliff slopes gradually, and so there is no sensation of standing on the edge of something and looking down at the sea far below. So, it turns out to be a strange anti-climax, in a way. There is a higher hill ahead. The other walkers pointed it out. (You can tell it is higher because its summit is above the horizon.) I check my map. Holdstone Hill and 349m above sea level. 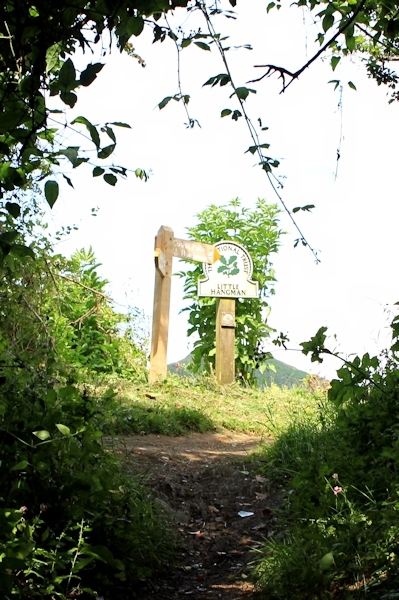 The route up Holdstone Hill looks clear and easy. It may not be on the official coastal path, but I decide to climb it anyway. Full of confidence, and with 90 minutes before my planned rendezvous with my hubby at a car park somewhere on the other side of Holdstone Down, I set off. But, I had conveniently chosen to ignore the warning contours on my map. Between me and Holdstone lies a steep cleft. Sherrycombe. No wonder the other walkers looked exhausted. The path descends very steeply and I slither and slide my way down into the valley. To make matters worse, the valley is full of flies. They buzz and whine around my face. Are they midges? Or biting flies? I don’t know, but they are very irritating. I swat them with my poles. At least they keep me moving. The only time I stop is for a quick photo of the bridge across the stream at the bottom. I stand still for less than five seconds and the buzzing is almost unbearable. In my mind, Sherrycombe will always be known as the Valley of the Flies. It is only because I slow down during my scramble up the other side that I realise there is another reason for the buzzing in my ears. Somewhere a farmer appears to be trying to get his tractor out of a ditch, and somebody else is hurtling around the field on a quad bike. I catch little glimpses of this drama as I puff and pant my way out of the valley. On the higher slopes of Holdstone Hill, I was hoping the breeze from the sea would blow the flies away, but the air is very still and it is some time before I lose the last of the pesky things. Now the path flattens as it circles around the shoulder of the hill. I forget my plans to walk up to the top of Holdstone and ignore the footpath that points up to the summit. Too tired for further climbing. A rustling and crashing sound from the bracken causes me some alarm. But it is only a stray sheep. It looks startled to see me. 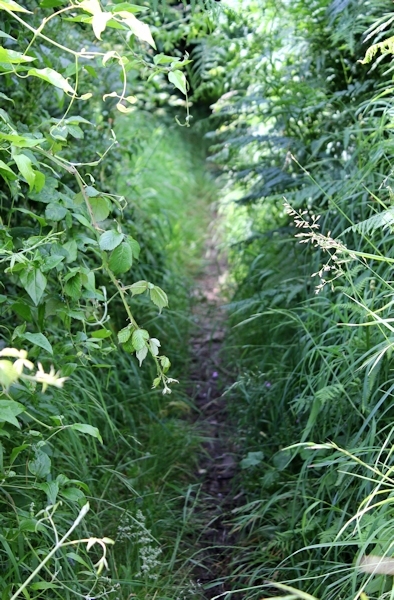 The remainder of the walk is straightforward and easy, if a bit monotonous. The stony track hurts my feet. I head for the only buildings in sight on the horizon. The road must be up there. I find the car park rendezvous and, out of four possible options, my husband has managed to pick the right one! He greets me with drinks and fruit, and “what took you so long?”. The view, in the mellow light of the evening sun, is truly lovely.